While trying to describe Messi’s relationship with and command of the ball is an exercise in futility, that doesn’t mean that there still isn’t anything to say about the Argentine genius. For all that he’s done, he continues to do the impossible, to bolster his legacy with greater and greater feats match after match, year after year. Take this season so far, for example. His four goals yesterday puts his La Liga tally at nine goals in the season’s opening five matches. With the entrance of a new manager this year, Messi has returned to his old position, once again playing as a false 9 after spending the MSN era on the right wing. That he was willing and able to drift out wide to accommodate Luis Suárez and at the same time maintain his alien scoring and assisting rates testifies to his otherworldly abilities, and should go down as one of the more remarkable feats in a career full of staggering achievements. But now, back in the center of the action, free from the burdens and benefits of playing alongside Neymar, and scoring at an unprecedented clip, Messi faces one of his toughest challenges, which, by extension, is also a great opportunity to pull off maybe the most impressive accomplishment of his club career: winning the title with this relatively weak Barça squad. This was a rotated group, yes, but the sheer number of less-than-world-class players surrounding the best player in the world is shocking. Because Barça’s chief rival for domestic and European glory always starts and ends with Real Madrid, it’s hard not to look at the Barcelona squad and notice how barren it is when compared to Madrid’s. Nearly half of the 11 members who took the pitch from the first whistle yesterday would probably never make an appearance in Real’s line-up. Real have multiple players on their bench who would probably be regular starters at Barcelona. After a terrible offseason during which Barcelona got worse as a team and frittered away time and money that could’ve been spent to get appreciably better, they’ve since seen the best signing they did make, Ousmane Dembélé, go down with a severe injury (his torn hamstring is expected to keep Dembélé out for about four months). Because of Neymar’s decision to leave and the club leadership’s consistent failure to keep the squad refreshed over the years, you could forgive the players for a trophy-less down year. And yet, instead of floundering, Messi has the team flying. 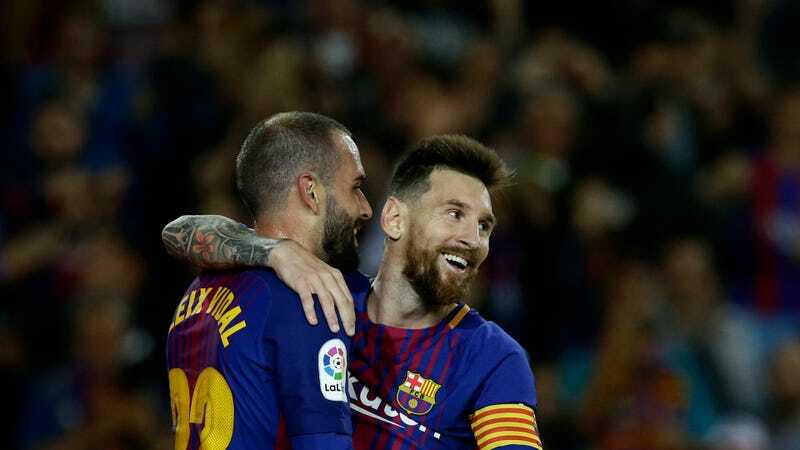 His nine goals have powered Barcelona to a perfect five wins in five league matches, five points higher in the table than Real (who have a game in hand). In Barça’s biggest test, their Champions League group stage opener against Juventus, Messi yet again dominated and dragged the team to victory. Should Messi keep this up and lead the likes of Gerard Deulofeu and Paco Alcácer and Thomas Vermaelen and Lucas Digne and an aging Andrés Iniesta and an off-form Luis Suárez to a title or two this year, this season could very possibly go down as the best testament to his unrivaled greatness. Having Messi really is like having a cheat code. By himself he is so extraordinary, so much better than anyone else playing the sport, that merely having him in a squad littered with declining former greats and young upstarts with limited upside turns that bunch into formidable foes in the hunt for all the trophies. Seriously, Real have so many better players than Barça do, but because Messi is so far off in his own stratosphere, Barcelona very well could wind up beating Real to the title. (Barça are currently favorites to lift the league trophy according to both the bookies and the nerds.) If Messi gets hurt for any extended period of time this could all change, of course, since without him Barcelona wouldn’t be anywhere close to where they are now. But with Messi, as we might be on the brink of discovering yet again, literally anything is possible. Just What In The Goddamn Hell Are Barcelona Doing In The Transfer Market?